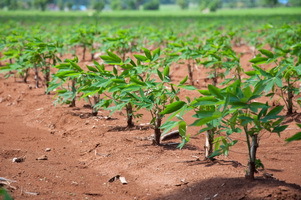 Cassava Brown Streak Disease (CBSD), which is caused by Cassava brown streak virus and Ugandan brown streak virus, interferes with successful cassava propagation in East and Central Africa. The disease is mediated by the interaction of these viruses with the viral genome-linked protein (VPg) and host eukaryotic translation initiation factor 4E (elF4E) isoforms of cassava. Scientist Michael Gomez from the University of California, Berkeley and colleagues aim to contribute in alleviating this problem by targeting novel cap-binding proteins (nCBP-1 and nCBP-2) for CRISPR-Cas9-mediated editing. These proteins are among the elF4E isoforms involved in the onset of CBSD. They observed delayed and attenuated CBSD aerial symptoms and reduced severity and incidence of root necrosis, which is one of CBSV infection symptoms, in the CRISPR mutants. CRISPR-Cas9 proved to be an effective tool in promoting disease tolerance in cassava. The researchers aim to study the effect of other remaining elF4E isoforms on CBSD to further design a cassava disease tolerance strategy.